Over the course of the three chapters of this thirteenth number we witness a sequence of remarkable walks. Firstly, Betty Higden’s terminal tramp westwards on a ‘pilgrimage’ to her own death; secondly, the tragicomic tableau of Mr Dolls trying and failing to negotiate London’s busy streets; and thirdly, the cat-and-mouse chase Eugene orchestrates for the benefit of his homosocial chum Lightwood by luring on the hapless schoolmaster, in and around Bethnal Green, in the deprived eastern quarter of the city. 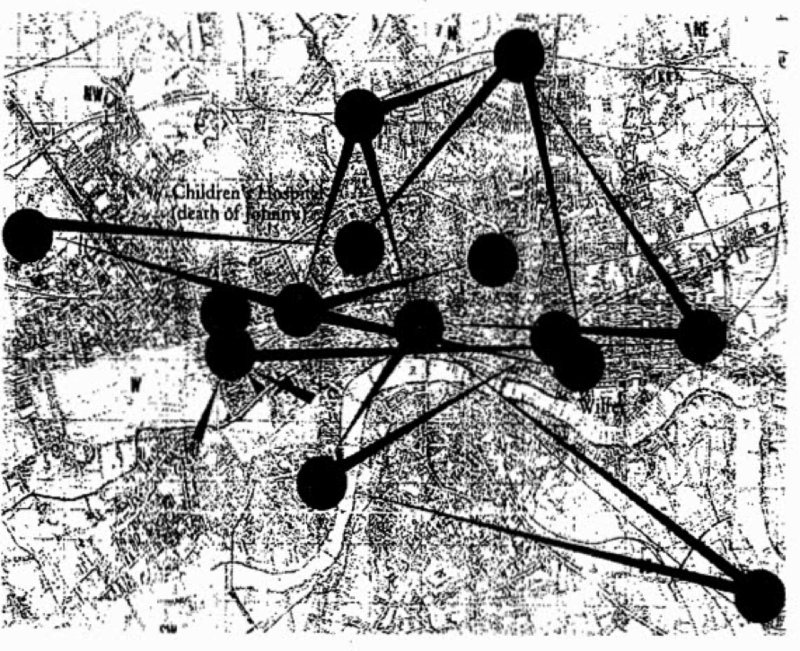 In this piece I want briefly to look again at the juxtaposition of these idiosyncratic modes of pedestrian mobility in this discrete reading sample of three chapters, stressing that beyond the explicit contrast drawn, the echo-chamber of the single serial number can jolt the reader to notice unexpected ambiguities within these episodes and resonances between them, surprises which may prompt us to think more seriously about what ideological or cultural work is being done by the rhetoric of Dickens’s last competed novel. A more ridiculous and feeble spectacle than this tottering wretch making unsteady sallies into the roadway, and as often staggering back again, oppressed by terrors of vehicles that were a long way off or were nowhere, the streets could not have shown. Over and over again, when the course was perfectly clear, he set out, got half way, described a loop, turned, and went back again; when he might have crossed and re-crossed half a dozen times. Then, he would stand shivering on the edge of the pavement, looking up the street and looking down, while scores of people jostled him, and crossed, and went on. Stimulated in course of time by the sight of so many successes, he would make another sally, make another loop, would all but have his foot on the opposite pavement, would see or imagine something coming, and would stagger back again. There, he would stand making spasmodic preparations as if for a great leap, and at last would decide on a start at precisely the wrong moment, and would be roared at by drivers, and would shrink back once more, and stand in the old spot shivering, with the whole of the proceedings to go through again. Walter Benjamin theorised the city pavement as one of the key theatres of urban modernity, the ever-present threat there of collision producing an unprecedented culture of seemingly miraculous spatial negotiation. Hyper-charged nodes of traffic create a new kind of ‘electrified’ urban subject, but Mr Dolls (as Eugene calls him) is not ‘equipped with consciousness’ sufficient to the phenomenon and is instead paralysed at ‘dangerous intersections’. Unlike his daughter, who dodges the carriages and legs of the fashionable ladies she seeks out in order to gain inspiration, unbeknownst to them, for her dolls’ dresses, and unlike, too, Silas Wegg, who stubbornly endures the water-cart, which, ‘as if it were drunk or short-sighted, [comes] blundering and jolting’ around the stall he keeps by the house near Cavendish Square, Jenny’s father is incapacitated by the aleatoric rhythms of the city. Of course, part of Dickens’s purpose is to caricature the lamentable feebleness of this individual, drawing attention to one of the everyday ways in which this adult has farcically regressed to a stage of educational achievement of which streetwise teenagers would be ashamed. But Dickens also draws out a poignancy from this failure in urban subjectivity, and the passage stands in part as a document to the inequalities the urban thoroughfare presents to its differentially abled practitioners: ‘stimulated by the sight of so many successes’, the unsuccessful Mr Dolls suffers a kind of agoraphobic arrest, which reminds us of a much more overtly sympathetic character the novelist had constructed a quarter of a century ago: Barnaby Rudge. One of the ‘grown-up children’ Malcolm Andrews has identified as a persistent feature of Dickens’s work, Mr Dolls mimics the shape of his own developmental regression through his spatial practice of ‘looping’ back on himself. Time and again he ‘sallies’ forth, before returning to the pavement, ‘oppressed by terrors of vehicles that [are] a long way off or…nowhere’. The narrator thus equates the physical recurrence plotted out in that shape of the loop with the psychological sense of being tormented by one’s own imagination. This combination of geometry and psychology anticipates Eugene Wrayburn’s cruel caprices later on in the chapter, when the insouciant lawyer intentionally turns back on himself in order to take more fully the measure of the success of his endeavours to torment his rival. ‘Torturing himself’, Headstone passes Wrayburn ‘in the dark, like a haggard head suspended in the air’, which points, of course, to another kind of loop, i.e. the noose. Inflecting Hegel’s master-slave dialectic with a spatial dimension, Dickens shows how the hunted one might be reconceived as master of the hunter. An uneasy class politics hovers beneath this appropriation of an aristocratic rural blood sport within an overcrowded impoverished part of London, and when Eugene remarks “There is a rather difficult country about Bethnal Green”, the reader both enjoys the pun on the place-name and is discomforted by the archness of the joke, which further emphasises the class imbalance between the two parties of this so-called hunt. This manic chase around the ‘field’ of the East End is, after all, a means for Eugene to flaunt an upper-class flâneur’s sense of ownership of the city, an expansive, ludic take on the metropolis’s nooks and crannies the schoolmaster can (literally) ill afford. Whereas Mr Dolls is disabled by fear of the real or imagined vehicles clogging the street, for Headstone the cabs are dangerous not as obstacles in his pedestrian path but as drains upon his all-too-limited pocket. In Eugene’s appropriation of the motif of the hunt, he plays not only the role of the lucky cunning foxes, evading capture, but also that of the privileged aristocrats in charge, blowing the bugles. The schoolmaster is revealed as the ‘poor dogging wretch’, by contrast, occupying only the ignominious position of the worn-out, hungry hounds. In its sustained deployment of hunting imagery, the chapter picks up on the rhetoric used to render the spatial practice that had opened this number of the serialized text: Betty Higden’s final ‘flight’ to her death. As the narrator has it, Betty creeps ‘into a copse, like a hunted animal, to hide and recover breath’. But who is hunting her? The spectre of political economy, I suggest. A testament to the nineteenth century’s taboo upon asking, like Oliver, for more, Betty has internalised contemporary anti-welfare discourse to such an extent that in her desperate evasion of the workhouse she fulfils, through her body’s self-exhaustion, the ungenerous rate-payers’ darkest Malthusian death fantasies. The illustration by Marcus Stone entitled ‘The Flight’ poses the hunter-hunted division between society and Betty as an actual one, delineating her anxious backwards-glancing figure hurrying onwards from a vigilante-like crowd a few metres behind her. But the narrator undermines this literalisation of the hunt metaphor by indicating that she hallucinates as much as she observes. Not only does Betty misrecognise at her death Lizzie as the ‘boofer lady’ (Johnny’s name for Bella), earlier she had been subject to the nightmarish vision of ‘furious horsemen’ riding at her and melting away when they drew near. Betty’s terminal walk, then, is represented as neither hermetically self-motivated nor provoked by an immediate social cause, being instead the result of her life-long internalisation of society’s attitudes to the houseless poor. Those horsemen, recalling the four horsemen of the apocalypse, are some of the many instances of intertextual contact between this episode and scripture, and indeed, Betty’s perception of being hunted is surely meant to remind us, jarringly, of Matthew 8:20: ‘The foxes have holes, and the birds of the air have nests; but the Son of man hath nowhere to lay his head.’ Through her imitation of Christ, the persecution and death of Betty Higden reaches us not only as a hunt for an innocent beast, but also as a kind of martyrdom. Betty is lifted up at the end of the chapter to the reader, as an exception, whose resistance to charity makes her a kind of Christ-like scapegoat for society’s disapprobation: ‘the best of the poor detest our mercies, hide their heads from us, and shame us by starving to death in the midst of us’. It is via this drift towards the hagiographic that we can account for the other structuring metaphor behind the representation of this spatial practice: pilgrimage. In addition to hunting, after all, the narrator repeatedly (three times) depicts Betty’s walk not only as a fear-compelled flight away from her oppressors but also simultaneously as a kind of holy progression towards the unknown place of her death. That shape of the loop we’ve traced elsewhere in this month’s number is thus enacted, once more: Betty is both running away from danger and proceeding towards her death. It’s an odd idea, to be a pilgrim upon one’s own Via Dolorosa, before the martyrdom has yet occurred. But the word is intended to include us readers too: witnesses to the shameful end of a poor woman who sacrifices herself to the Malthusian logic of her age by walking unto death, we walk as pilgrims alongside her. Looking back on the moment of Betty’s death, it seems to be haunted by the ghost of sculpture, for it could well be to some kind of pedestal that Lizzie lifts up the old woman’s dead body, a body that has been gradually de-animating throughout the walk, becoming cold and numb, as she wears it out. Sculpture has been much in the minds of Victorianists of late, due to the current Tate Britain exhibition, and so it seems a good thought upon which to conclude. An intrinsically politicisable form of art, sculpture was the theme of a memorable closing plenary given by Michael Hatt at the BAVS conference a couple of years ago at Royal Holloway, in which he explored the peculiar conditions governing the production of statues, wherein the effacement of labour by capital is performed grotesquely in extremis. In the exhibition catalogue for that show, we are reminded that in William Morris’s representation of a post-revolutionary society in News from Nowhere (1891), sculpture has been removed from Westminster Abbey in order to declutter and restore it to its former beauty. Reading closely the present month’s number of Our Mutual Friend, we realise that Morris may have owed this part of his vision to Reverend Milvey’s anti-sculptural stance. Dickens’s last novel is elsewhere more explicitly an intertext with News from Nowhere, as Morris includes a character with the name of Boffin; moreover, the importance of the river and scenes of rowing represent further strong evidence of intentional connections between the two books. As Patrick Parrinder has put it, ‘the world of Our Mutual Friend’ is that whose ‘negation Morris set[s] out to present in News from Nowhere’. In Reverend Milvey’s rejection of sculpture, however, it appears that Our Mutual Friend offers not only the critical social realism against which Morris could mount his utopian thesis, but also some glimmerings of utopian hope for a world that is ‘richer’ than that afforded by the status quo to which it is confined. Walter Benjamin, ‘On Some Motifs in Bauderlaire’ (1939). Malcolm Andrews, Charles Dickens and the Grown-up Child (Iowa, 1994). ‘Becoming a separate parish in 1743, [Bethnal Green’s] western end was packed by poor weavers, the Spitalfields overspill; the east part, still ‘green’, was settled by market gardeners and a sprinkling of comfortable suburbanites. It leapt from 15,000 inhabitants around 1750 to 85,000 in 1851, turning from attractive semi-rurality into London’s poorest parish.’ Roy Porter, London: A Social History (Penguin, 1994) p118. 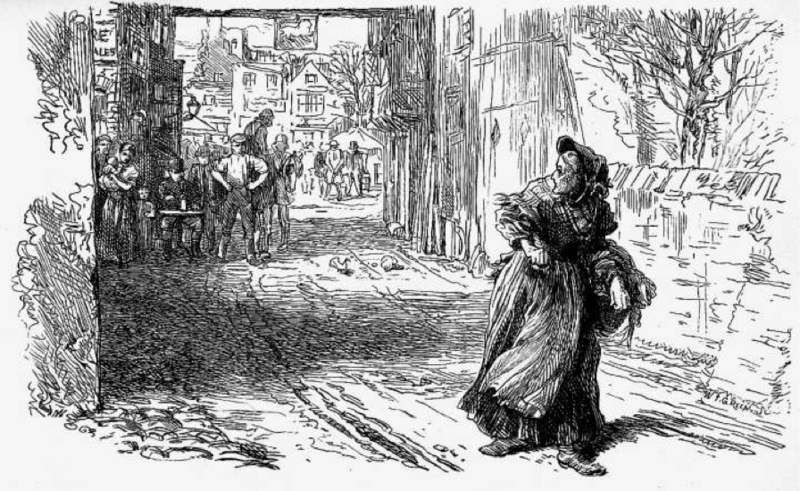 Notwithstanding the metonymic function of her case, standing in as she does for the many Dickens wanted to champion, the narrator also clearly singles out for praise this pauper with no ‘sublunary hope’ higher than the aspiration ‘patiently to earn a spare bare living, and quietly to die, untouched by workhouse hands’. In dying successfully having ‘escaped’ charity, Betty is a strange kind of martyr, her tragedy embodying not a remarkable resistance to the dominant ideologies of her time but a chilling accommodation with them. It is noteworthy that Dickens uses the idea of pilgrimage once elsewhere in the novel, to characterise Riah’s leading of Fledgby up the stairs to the roof, where Jenny Wren imagines herself blissfully dead. In this context, both uses of the term clearly participate in the novel’s discourse upon the city, each recognising in spaces beyond London’s clutches (the cleaner air above the din of the streets; the unsullied river before it has collected the ‘scum’ of urban pollution) as a site of spiritual recreation. Martina Droth, Jason Edwards, Michael Hatt, Sculpture Victorious: Art in an Age of Invention, 1837-1901 (Yale, 2014). Patrick Parrinder, ‘News from Nowhere, The Time Machine and the Break-Up of Classical Realism’, Science Fiction Studies, 3 (1976), 265-74 (p. 268).